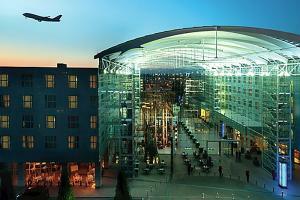 Relax, unwind and explore at the Hilton Munich Airport, found between terminals 1 and 2 of the Munich Airport. The hotel's location makes it a perfect place for a short rest while traveling and a convenient home base for exploring the wonders of Munich. The hotel also offers a heated pool, spa and fitness center, and a signature restaurant on-site. Located between Terminal 1 and Terminal 2 of the Munich Airport.